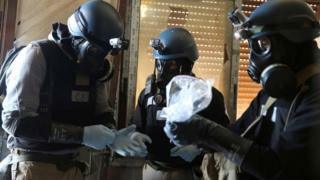 Russia and China have vetoed a UN resolution to impose sanctions on Syria over the alleged use of chemical weapons. It is the seventh time Russia has vetoed a UN Security Council resolution to protect the Syrian government. China has also vetoed six Security Council resolutions on Syria since the civil war began in 2011. Syria agreed to destroy its chemical weapons in 2013 under an agreement negotiated between Russia and the US. What is Syria accused of? The Syrian government of President Bashar al-Assad is accused of carrying out chemical attacks on its own civilians - a charge it denies. However, investigations by the UN and international chemical weapons watchdog have found that Syrian government forces carried out three chemical weapons attacks in 2014 and 2015. The reports said that Syrian air force helicopters had dropped chlorine gas on rebel-held areas, twice in March 2015 and once in April 2014. The use of chlorine as a weapon is prohibited under the 1997 Chemical Weapons Convention. Islamic State (IS) militants had also used sulphur-mustard gas in an attack, the watchdog found. Why is Russia engaged in Aleppo? What did the UN resolution say? Tuesday's resolution had been drafted by the US, the UK and France. It would have banned the sale of helicopters to Syria and would have led to sanctions against 11 Syrian commanders or officials, and 10 groups linked to the chemical attacks. Nine Security Council members supported the resolution, while three - China, Russia and Bolivia - voted against it. The final three members - Egypt, Kazakhstan and Ethiopia - abstained. Image caption Russia vetoed the resolution, saying the vote was "based on the anti-regime doctrine of western states"
A Security Council resolution needs nine votes in support, and no vetoes from the five permanent members (the US, France, Russia, UK and China) in order to pass. Why did Russia and China veto the resolution? Russian President Vladimir Putin had said sanctions against Syria would be "totally inappropriate", saying "it would only hurt or undermine confidence" in peace talks. Moscow has long-standing links to Syria, with many Syrian military officers trained and equipped by Russia. Moscow says its military and political support for the Syrian government has helped the fight against IS militants. But Western critics accuse Moscow of targeting opposition groups backed by the West. Meanwhile, China's UN ambassador, Liu Jieyi, said Beijing opposed the use of chemical weapons but that it was too soon to impose sanctions as investigations were still ongoing. China has said in the past that it has a long-standing policy of non-intervention in other countries' affairs. Analysts say China may be worried that some of its Muslim populations in western Xinjiang have joined militant groups fighting in Syria. What do sanctions supporters say? The US ambassador to the UN, Nikki Haley, said: "It is a sad day on the Security Council when members start making excuses for other member states killing their own people. "They put their friends in the Assad regime ahead of our global security... the world is definitely a more dangerous place." UK Ambassador Matthew Rycroft said: "Not taking action against chemical weapons' use undermines confidence in the international community's ability to tackle flagrant violations of international law - and undermines the trust of Syrians affected by these horrific attacks." French Foreign Minister Jean-Marc Ayrault said Russia bore a "heavy responsibility toward the Syrian people and humanity as a whole".